The Ngorongoro Serena Lodge is built into the rim of the Ngorongoro Crater, which allows the plant and ivy-covered native stone to blend masterfully with its surroundings. Today the volcano and surrounding landscape are part of a vast conservation area inhabited by the Masai tribe. You will enjoy a variety of big game and birdlife as you venture on game trips down to the crater floor. Most of the 75 guest rooms at the Serena Lodge have private terraces with views of the crater floor, ensuring a leisurely game viewing experience. Rooms are centrally heated and all have en-suite shower facilities. At Ngorongoro Serena Lodge visitors co-exist in perfect harmony with the natural environment and the wildlife that inhabits it. Picnic luncheons are served on tours of the crater floor and excellent dinners are served on your return from a game drive. There are exciting cultural events at Serena Lodge, including Maasai dancing and celebratory presentations. In the evenings a choir or a guitarist performs for guests. High on the southwestern rim of Ngorongoro Crater, stands Ngorongoro Crater Lodge. With commanding views of the Crater, the lodge offers you three adjacent camps with 30 suites perched on stilts on the crater rim. Resembling a magical Masai village, the lodge is set in classic crescents. 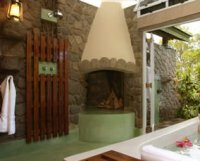 Each stone and thatch suite has spectacular views of the crater from large glass windows in the bathroom, lounge, and bedroom, which makes it renowned for superb game viewing. The North and South camps have 12 suites each, while the intimate Tree Camp has six suites. All luxury suites have en suite bathrooms with chandelier-lit bathtubs and showers, and a personal butler who tends to all your requirements. The three exclusive camps operate independently, each with a central living area and viewing deck overlooking the crater. African cuisine is served in the outdoor dining area near a log fire, or in the dinning room. The Lodge has numerous activities including croquet, board games and also game drives & bird watching in Ngorongoro or, Serengeti Conservation area, walking safaris, Masai cultural visit, sundowners and bush breakfasts, excursions to the "Shifting Sands". Ngorongoro Sopa Lodge is located on Lemala Hill on the uppermost, eastern rim of the Ngorongoro Crater. The Ngorongoro Sopa Lodge is the only tourist development on the eastern rim of the crater and thus offers you unique and spectacular views down into the crater floor and of the sunsets from the west. Another major advantage of this location is that you can embark on your crater safari within five minutes of leaving the lodge. The lodge has 100 suites, all of which enjoy magnificent views into the crater. Each suite is carpeted and heated by oil fired central heating radiators. The spacious bedrooms contain two comfortable queen sized beds and fully tiled bathrooms equipped with baths, showers and WCs. Each suite has an enclosed 'solarium' with comfortable rocking chairs perfect to relax in. A small private lounge with a writing desk and a drinks refrigerator provides extra privacy to the suite. The lodge prides itself of its high standards of service and friendliness. Perched on the rim of the Ngorongoro Crater at 2,286 meters above sea level (with a 600 m sheer drop down to the crater floor), the Ngorongoro Wildlife Lodge affords one of the greatest views of the crater. Its 75 rooms are centrally heated, and the lounge features a fireplace and panoramic windows which open on to a terrace serving as an observation deck for the crater below. 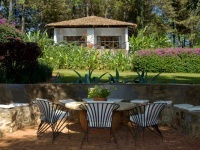 The lodge is a 4-hour drive from Arusha and 90 minutes from Manyara. Lemala is a new intimate camp on the rim of the Ngorongoro Crater offering luxury accommodation under canvas in large spacious tents with wooden platform and rugs. The entry route into the Crater is 5 minutes away and is used by very few vehicles. The scenery is stunning and the wildlife abundant as you descend into the Crater. Facilities : The dining-mess area is beautifully furnished with grand sofas, lamps, book and corner cabinets in old wood, chests and rugs. Meals are served al fresco or inside the mess and all guests are invited to sit together with the naturalist at dinner time. Lemala Ngorongoro offers great charm and luxury in a delightful prime location on the rim of the crater. Accommodation : Each tent has 2 large single beds or a king size double bed with thick duvets for warmth and comfort, a heater to warm the tent, and a private bathroom that includes a dressing area, flush toilet, shower and basin with running water. There are only 8 tents in the private concession to ensure privacy and seclusion. At the entrance to the Highlands, midway between Lake Manyara and the Ngorongoro Crater, five kilometers from the village of Karatu, is Gibb's Farm. Gibb's Farm is an oasis of green, calm and beauty, in a landscape that can often be parched, dry and dusty. The lodge offers 20 twin rooms with unsuited bathrooms set among the gardens. The main facilities, consisting of a sitting room, reading room, dining room (which serves fresh, home-cooked meals), bar and gift shop, are situated in the old farmhouse. Coffee is grown, processed and roasted on the farm, and a ten-acre fruit and vegetable garden provides nearly all the fruit and vegetables for guests, who wake up to fresh coffee, a multitude of flowers and breathtaking views. Is surrounded by coffee plantations and the famous ‘green hills of Africa’ that Hemingway found so inspiring. Its romantic setting and high standards of accommodation, food and service have made it a popular location for weddings. This small hotel has just 15 elegant, ensuite rooms. The accommodation is divided into different self-contained houses, so the place has a private feel and guests can be totally independent, with their own dining room and sitting room with bookshelves and a fireplace as well of plenty of outside sitting space on the verandas. There's even a little hatch in the wall of the rooms so that drinks can be delivered without disturbing the guests in their bedrooms. There is also a group house, with four double suites, all en suite and a large dining room. This is ideal for a family or large group. Every room has its own style. African safari-antiques and Tanzanian arts and crafts dominate the room, without neglecting modern European comfort. Is an exclusive lodge on a 500-acre coffee farm, giving you the freedom to relax in the quiet beauty of the area. Take in the amazing views of Oldeani Volcano as you walk through the coffee plantation. The lodge is divided into three camps, with a total of 40 rooms. It's designed as an old colonial farm and each room has been decorated using rustic local materials, offering you an imaginary journey to the days when the farm was still young. Ngorongoro Farm House is the perfect stopover between safaris as it's located just 5km from the entrance to Ngorongoro Gate Olduare. Is located in the outskirts of Karatu, some 12 kms from the Ngorongoro main Gate Olduare. Due to its location this simple but comfortable Lodge is a great place for a stopover visiting Tarangire, Lake Natron and Ngorongoro Crater. The lodge offers 18 large, self contained cottages with comfortable bedrooms. Each room is fitted with mosquito nets, hair dryer, hot and cold water, a veranda, and a fireplace ! The lodge also has a bar with a selection of soft drinks, south african wines, local and international beers, and spirits. The restaurant offers lunchs a la carte, and for dinner a buffet, which caters also for vegetarians. Ndutu Safari Lodge is situated in the Ngorongoro Conservation Area in the southern Serengeti eco-system. The lodge nestles unobtrusively under a canopy of giant acacias overlooking a soda lake, Lake Ndutu, and offers a superb base from which to explore the swamps, woodlands, soda lakes and the world famous Serengeti short grass plains. Ndutu Safari Lodge has been a favorite with professional wildlife photographers and film-makers for the past four decades, simply because it’s one of the best places to watch wildlife. 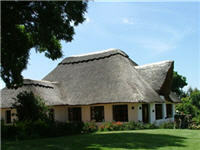 Ndutu Safari Lodge consists of 34 stone cottages that extend from the central, open-sided bar, lounge and dining room. Each room has its own verandah that overlooks Lake Ndutu. All rooms have en-suite facilities. The cottages are made from local materials and offer comfortable, tasteful accommodation. Four rooms have a king-size bed and there are also four family rooms accommodating up to four people. All other rooms have two single beds. Rooms are single storey and are accessible with a wheel chair. The lodge offers good quality home cooking. Le Lemala Luxury Camp Serengeti is a semi-permanent camp which follows the migration route. There are only 8 tents in the private concession to ensure privacy and seclusion. This Camp offers great charm and luxury in a somptuous nature location. From December to March Lemala Serengeti Camp is tucked away in an acacia grove from where guests discover nature and wildlife on the spillway that extends from Lake Ndutu towards Kusini. Indeed the spillway's permanent salts and water attract wildlife prone to visiting the camp daily. The predators are not far away and use the grass cover on the edge of the spillway to plan their hunt. Lemala Serengeti in Ndutu offers exceptional game viewing. Game walks are also possible here..